We have quite alot to celebrate here today. At the the tippy-top of the list is the birthday of our youngest, Tessa. And today she turns six. Until Tessa grows into the job of her dreams of being a real cowgirl, she is making do with miniature stables and dozens and dozens of toy horses. 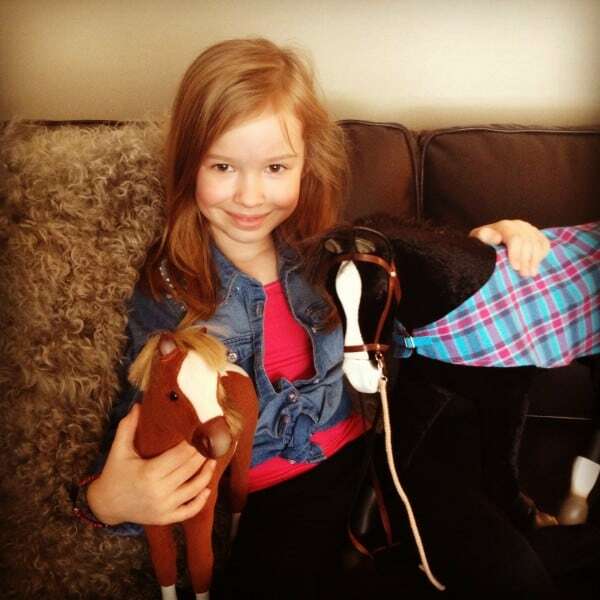 I don’t know how she does it, but all the horses have their own special name and she never forgets a one. Tessa loves any kind of lemon desserts. And she adores raspberries, especially when they’re fresh picked from our yard. She is the one that will stick it out with me in the raspberry patch until the very last berry is picked. Her company is bubbly and chattery, rich with humming and singing, and best of all…full of big squeezing lingering hugs. This girl’s warm presence can turn any cloudy day into sunshine. So these sunshiny Lemon Baby Cakes with Fresh Raspberry Buttercream is what we came up with to celebrate her special day. They are perfectly Tessa. 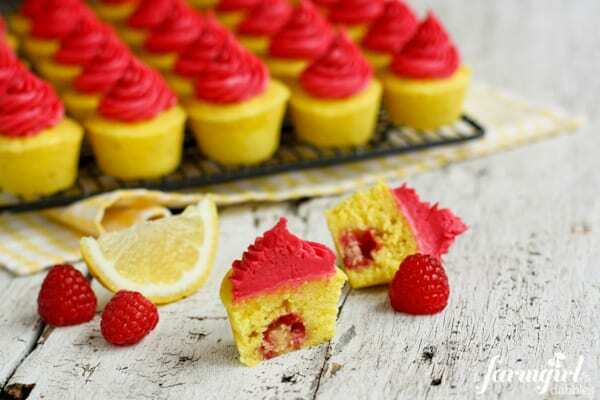 The little cakes are super moist and bright with lemon flavor, and when bitten into, reveal a hidden fresh raspberry inside. Tessa thinks that’s just the neatest thing! 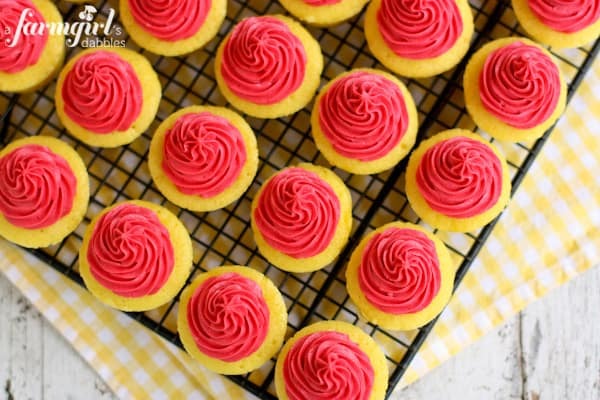 Topped with a swirl of fresh raspberry buttercream (with no artificial color or raspberry flavor! ), these are one sweet little treat. 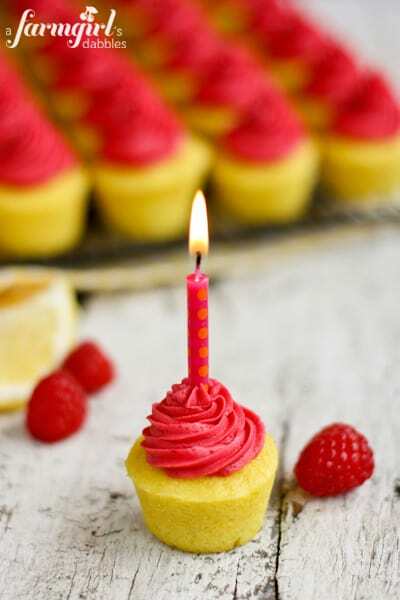 The other event we’re celebrating today is the blogiversary of a farmgirl’s dabbles. Three years, my friends! That’s alotta butter and flour! Be sure to stay tuned later this week for an awesome giveaway to keep the celebrating going! A couple notes: I prefer to use flexible silicone mini muffin pans with no paper liners for this recipe, but you can also prepare metal mini muffin pans with paper liners. Also, I found that there are different sized mini muffin pans out there, so your yield and baking time may vary a bit. The silicone pans I used yield a little bigger mini cupcake than others, which I also happen to like. Whisk flour, baking powder, and salt in medium bowl and set aside. In a large bowl, beat butter until smooth. Add sugar and beat to blend. Beat in eggs 1 at a time, then the lemon juice, lemon peel, and food coloring. Batter may look curdled, but that’s just fine. Beat in the flour mixture alternately with the buttermilk, in 3 additions. 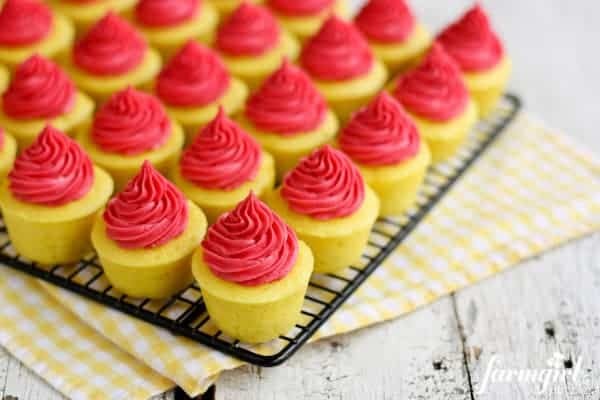 Place about 1 tablespoon of batter into bottom of each cupcake hole. Place 1 fresh raspberry on top of the batter, in the center. Cover raspberry with more batter, about 3/4 full. 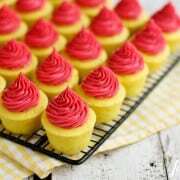 Bake cupcakes until tester inserted into center comes out clean. This took about 20 minutes for me, but it will depend on the size of your tins, so pay close attention to your baking time. Cool 10 minutes and remove from pan. Cool completely before adding frosting. Cook the raspberries in a medium saucepan over medium heat, stirring frequently until the raspberries are broken down into a sauce. Set a fine mesh strainer lined with 2 layers of cheese cloth and set over a bowl. Pour the raspberry sauce over the cheese cloth to remove the seeds. Gather up the ends of the cheese cloth and press out all the raspberry juice with the back of a spatula. You should be able to get at least a half cup of juice from this amount of berries, but I can usually press out almost 3/4 of a cup. Pour the raspberry juice back in the pot. Simmer until the juice reduces to a 1/4 cup. It will be a very rich red and concentrated sauce. Set aside to cool completely. With a mixer, cream the butter with a paddle attachment on medium high speed about 2 minutes, until lightened in color and a bit fluffy. Add 2 cups of powdered sugar, the 1/4 cup of cooled raspberry sauce, lemon juice, vanilla, and salt. Mix until smooth. Add another 1-1/2 cups of powdered sugar and mix until smooth. If you want the frosting less stiff, add some milk, 1 tablespoon at a time. I did not add any milk to mine, and thought it was perfect for piping. Fit a pastry bag with a medium star tip (I used a Wilton #21) and pipe the frosting onto your baby cakes. Adapted from the fabulous Lime Baby Cakes and Fudgy Spring Brownie Bites. Disclosure: This post contains an Amazon affiliate link for the silicone mini muffin pans. To read the full disclosure of this site, please go here.